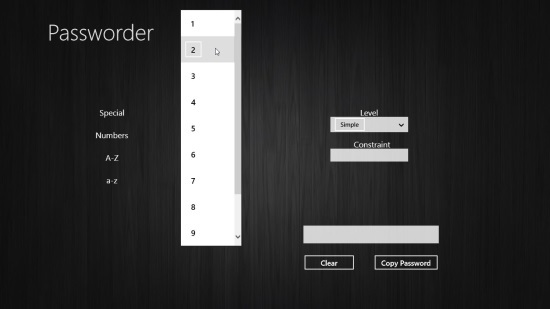 Passworder is free Windows 8 password generator app that lets you generate strong and unique passwords with ease of a click. The app allows generating passwords using a mix of special characters, numbers, lowercase and uppercase letters, hence ensuring that the passwords are highly secure and difficult to crack. You can specify how many special characters, numbers, and alphabets (both uppercase and lowercase) you want in the password, and optionally set a constraint you want to be followed in the password. Besides that, you can select the difficulty level (simple or complex) for your password, and once generated, you can copy the password on the clipboard and paste it anywhere you want. We have earlier covered many similar Windows 8 password generator apps, but the best thing about Passworder is that it’s just a single screen app and is extremely simple. Anyone can use it without any problem. Passworder can be downloaded using the link given at the end of this article, or from the Security category in Windows Store. Let’s see how this Windows 8 app works. After installing Passworder in your system as you launch the app, you would be taken to the main screen where you would see some dropdowns on the left and right. Using these dropdowns, you can specify your preferred number of characters, digits, and letters, and set the difficulty level for generating password. The constraint can be specified in the given text box and it can be a word, a series of numbers, or anything. Once you are done, you just have to click on the “Generate” button, and there it is: your password in front of you. If you are not-so-happy with the password and want to try another password using the same character combination and constraints, you can repeatedly click the Generate button until you find the desired password. There’s a also a “Clear” button available, which allows you to clear all the set preferences with one click and enter new parameters again. Once you are done, you can click the “Copy” button to copy password on the clipboard. You can then paste it anywhere you want, simply by using Ctrl+V. If you want to store these passwords to a secure place, you can try out some handy Windows 8 password manager apps. 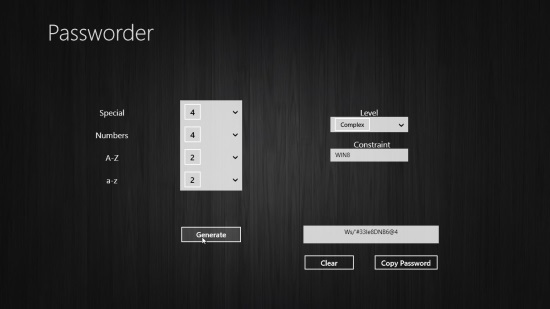 Free Windows 8 password generator app. Generates strong and unique passwords. Passwords can be minimum 6 and maximum 20 characters long. Allows using a combination of special characters, numbers, uppercase letters, and lowercase letters for generating passwords. Allows copying passwords on clipboard. Can generate simple or difficult passwords. Can be snapped for multitasking. Passworder is a nice Windows 8 password generator app that offers generating strong and secure passwords in a very simple and easy way. A must try if you are looking for a similar app.